When it comes to religious doctrine, Jehovah’s Witnesses are the epitome of irony. How so? They are adamant they have the truth. However, their doctrine goes through constant change. If you were to type in “change” into the search feature of this web site, you will find various changes. Do a search to find some of their more recent changes. You will find changes to the “faithful and discreet slave” and the “Generation“. There are changes to bible verses. And you’ll also find changes to policies. Considering the foregoing, do we expect an end to their constant change? Not any time soon. Why? Because they now have a new change. And what’s most noteworthy is how they introduce it. The article is designed to encourage regular attendance at meetings in the Kingdom Hall. The article suggestively positions the governing body of Jehovah’s Witnesses as “God’s Organization”. It then requests submission and loyalty to their direction, as if it were from God. Do You Highly Esteem Jehovah’s Book? This article sets the stage for the following two articles. On page 16, paragraph 10, it reads in part, “Think about the many organisational changes that have been made during the past decade – and bear in mind that Jehovah is behind such developments”. A subtle but powerful statement. This is the first part of a two-part series redefining an aspect of Jehovah’s Witnesses’ doctrine. It reviews the long-standing belief that there was a parallel between ancient Israel’s captivity in Babylon in 607 BCE and the captivity of Jehovah’s Witness leaders in 1918. This article is the final part of a two-part series redefining an aspect of Jehovah’s Witnesses’ doctrine. It clarifies for Jehovah’s Witnesses how ancient Israel’s captivity no longer corresponds with their leader’s imprisonment in 1918. Instead, a parallel is drawn with a doctrine taught over 65 years ago. The first article encourages members to attend meetings. Being at meetings improves the likelihood that Jehovah’s Witnesses will prepare for the Watchtower study. Preparing for the Watchtower articles that follow the initial one improves the indoctrination process. This in turn, will ensure quick acceptance of the new change in doctrine. 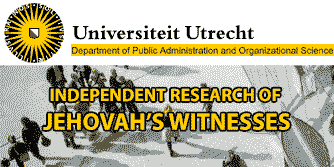 The second article attempts to convince readers that the teachings of the Governing Body of Jehovah’s Witnesses are inspired of God. It provides evidence that Jehovah “is the incomparable Organizer”. However, it provides no evidence that the Governing Body is God’s Organization. 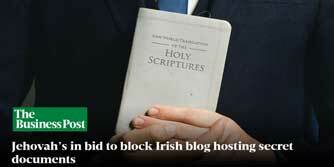 Yet the article directs readers to loyally submit to the direction of the Governing Body. This is key when considering the change made in doctrine. In terms of convincing Jehovah’s Witnesses of the new change, the third article is probably the most important of all. It tells readers not to be quick to take offense. They need to work at being less sensitive and more forgiving. It directs regular meeting attendance. Ironically, it urges readers to promote unity of doctrine. Simply translated: “Accept the new doctrine and forgive us for the error we made for the last 77 years.” This notion is enforced in paragraph 10 on page 16 when it says that “Jehovah is behind such” changes. Their own schools for indoctrination (Pioneer school, Gilead School etc) are described as forms of education. Loyalty is also reinforced. No decision should be made without seeking help from “God’s organization”. The article ends with the promise that loyalty to the organization will mean living forever. The final two articles discuss the change in doctrine. The first article explains the original doctrine: a parallel in prophecy between Babylonian captivity of Israel in 607 BCE and the imprisonment of senior Jehovah’s Witness officials in 1918. The second article suggests the new doctrine. Since 1939, the Governing Body of Jehovah’s Witnesses, or “God’s Organization” as they like to think of themselves, had their adherents believe that there was a prophetic parallel between Israel’s 70 year captivity in Babylon in 607 BCE and the brief imprisonment of leading officers of the Watch Tower Society in 1918. That was until now. In the article, Called Out of Darkness, the writers have the audacity to say that The Watchtower only “suggested that God’s modern-day servants entered into Babylonian captivity in 1918 and that they were released from Babylon in 1919.” The evidence will show that it was more than a suggestion. It was clearly stated. See also, The Watchtower July 15, 1981 pp. 16-19 pars 1-12; Feb 1, 1972 p. 79 par. 11; Oct 15, 1972 p. 631 par. 11; Dec 1, 1970 p. 726 par. 26; Jan 1 1968 p. 20 par. 51; May 15, 1966 pp. 310-311; Sep 15, 1966 p. 553,559 pars. 2,17; Feb 1, 1964 p. 80 par. 9; Jan 15, 1962 p.47 par. 26; Aug 1 1960 p. 462; Nov. 15, 1958 p. 691 par. 22; Dec 15, 1955 p. 749 par. 15; Oct 15, 1953 p. 630 par. 17; May 15, 1951 p. 303 par. 11. When was the original understanding that Israel’s captivity in Babylon had a fulfilment with Watchtower leaders imprisonment in 1918 and their subsequent release in 1919? This question is not an easy one to answer. Why? Because, although The Watchtower has been telling it’s members to “Get out of Babylon the Great” since 1919, the doctrine of their leader’s imprisonment and release as it relates to Israel’s captivity in Babylon from 607 – 537 BCE was not formulated. How do we know this? We know this from reading The Watchtower. Readers would do well to read the full article. It is entitled Prophecy and is found on pp. 125-127 of The Watchtower April 15, 1937. From reading the above paragraphs, one can quickly grasp that neither 1918 or 1919 correspond with 607 BCE or 537 BCE. 1919 corresponds with 612 BC and 1918 does not correspond with any particular date. So when did it become doctrine? We believe it was in 1939. In The Watchtower June 15 & July 1, 1939 there was a 2 part series of articles entitled DOOM OF RELIGION. It was in these articles that the old doctrine was introduced and it has remained in force from 1939 to 2016. From July 1939 to November 2016, this doctrine has been in place. For more than 77 years they have suggested that Israel’s captivity to Babylon corresponded with Jehovah’s Witness leaders’ imprisonment from 1918 to 1919! The Babylonian captivity of Israel in 607 BCE has a modern-day fulfilment when a person is held captive to “Babylon the Great”, which is what they believe is all false religion. The Israelite’s release from Babylonian Captivity in 537 BCE has a modern day fulfilment when a person becomes one of Jehovah’s Witnesses. They are then freed from “Babylon the Great” or false religion. Is this new understanding? No. Even as far back as 1881, The Watchtower has drawn a parallel between the Babylonian captivity of Israel and one being captive to false religion. See The Watchtower January 1881  (page 3 in the pdf). If Jehovah really is behind such developments, past and present, was he behind the change in 1939? If so, why are they changing back to a doctrine that dates back to 1881? Either Jehovah is unsure of His own truth or Jehovah is not behind such developments. Whichever way you look at it, it is blasphemy. Why? Because it shows a complete lack of reverence to God. (Truly I say to you that all things will be forgiven the sons of men, no matter what sins they commit and what blasphemies they speak. But whoever blasphemes against the holy spirit has no forgiveness forever but is guilty of everlasting sin.Mark 3: 28, 29; For the name of God is being blasphemed among the nations because of you, just as it is written.Romans 2: 24; compare What, then, should I do here? declares Jehovah. For my people were taken for nothing. Those ruling over them keep howling in triumph, declares Jehovah, And constantly, all day long, my name is treated with disrespect.Isaiah 52:5). God is clearly not behind these “developments”. If God was behind them, there would never have been a change from what was originally believed in 1881. Indeed, there wouldn’t have been various interpretations of it between 1881 and 1939. And god most definitely would not have been behind the 77-year false teaching that it represented a handful of nobodies who were imprisoned for a very short period of time in 1918/1919. It has always been imperative for The Watchtower to draw parallels between biblical narratives and their organization. This helps ensure members believe they have God’s backing. Connecting Israel’s captivity with their leader’s imprisonment for almost 80 years had achieved this. But now it’s time to change because time is moving on. And a false teaching that has absolutely no biblical support needs to be done away with. Jehovah’s Witnesses have always focused on the end being very soon. But it has been almost 100 years since 1919. Although the rank-and-file think Armageddon is imminent, their leaders aren’t so confident. They know that they need to remove as many references to dates as they can from their doctrine. Because as time goes on, and Armageddon doesn’t come, they will need to have their irrelevant dates gone from most of their doctrine. And that will at least help them to retain members. Jehovah’s Witnesses are quick to forget old doctrine and willingly embrace the new. And none of them are really sure what their doctrine is. They tend to leave that stuff “in Jehovah’s hands”. After all, they are too busy going door-to-door preaching a message that constantly changes that they haven’t time to keep up with their changes. They truly are captives of constant change.